Today we live in such a PC-friendly culture. Parents, programmers, and the likes of such are terrified of offending whomever or scaring whomever. Certainly, the 1980s was a different landscape when it came to children's entertainment, particularly animated movies. Today, we are seeing more animated films released then ever before, and while all of these movies are certainly fun, a great afternoon of family enjoyment at the movie theater, there are little if any scares at all associated with anything in the realms of Disney or Pixar. But, back in the 1980s animators, studios, or film-makers expressed any sort of worry when it came to the audiences of their animated feature length films. In fact, a large portion, not just of animated feature films but weekly cartoon series, segments in animated-anthology series were scary as hell if you were a kid that grew up in the 1980s. Perhaps, the best-known kids animated movie of the 1980s. NIMH was directed by the great Don Bluth, who many may know as the animated/creator of the popular 1980s animated cartoon/video games Dragon's Lair and Space Ace. The is adapted from the early 70's children's book called Mrs. Frisby and the Rats of NIMH. Mrs. Frisby is a field mouse who's son is injured when a tractor mows over their home and she must set out to film a cure for him. She sets off on a odyssey of great proportions encountering all kinds of animals, big and small, good and bad, in so that she may find what she needs in so that she can make her son well. NIMH is magic. It's a very powerful film and at the same time there are aspects to the NIMH story--animals that Frisby encounters--that will lilkely be frightening to adults today, some 30 years later, that see the movie for the first time. 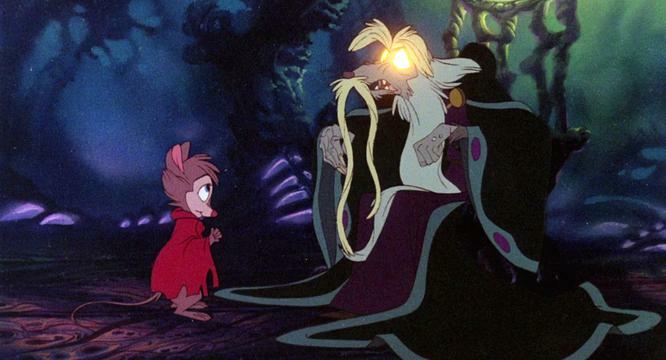 NIMH spawns a sequel almost 20 years later, but it lacked to have the same impact on the pop culture zeitgeist, no doubt, because of the times changing due to the ever-growing popularity of video games. 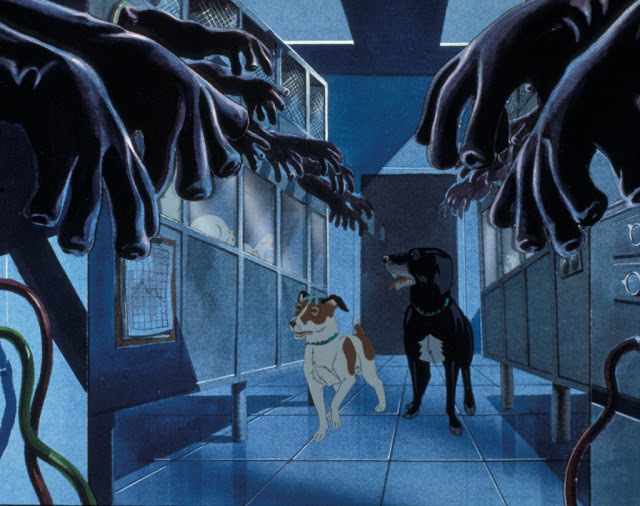 As disturbing today as it was when it was first released in 1982, The Plague Dogs is an animated feature that was shot in the United Kingdom. It was written and directed by Martin Rosen, the guy behind the equally disturbing apocalyptic animated Rabbit movie Watership Down of the 1970s. The movie is about two dogs who decide to escape from a science lab where tests are done on animals. The movie really addresses animal cruelty through the lens of animated action and adventure, and frankly, it is so upsetting, scary, and disturbing that after you've seen it, it will never leave you. Animated or not, it is just disturbing to see any type of animal being subjected to unnecessary testing in any labs. Tears of rage. Directed by Ralph Bakshi, whose name, no doubt, you've seen already a couple times on this list of bizarre children's animated movies of the 1980s list; Fire and Ice was a joining of ideas between Bakshi, a pioneering animator, with Frank Frazetta, a pioneering fantasy artist, who had previously worked together on another weird animated fantasy classic Wizards, made in 1977. 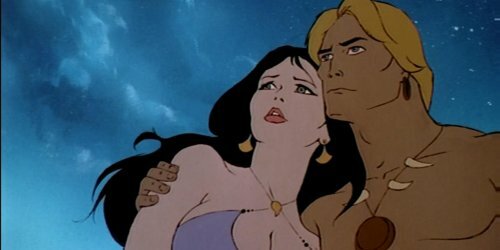 Fire & Ice combined Bakshi's and Frazetta's talents and the two set out to make an animated sword and sandal fantasy with a process called Rotoscoping--which finds animated or drawing/coloring been done over live action film footage to create a very surreal visual style. Its fair to assume that everyone that might be reading this is, no doubt, failure with Peter Jackson's Academy Award-winning Lords of Rings movies with Sean Austin and Elijah Wood. But did you know that before Jackson brought the Tolkien story to the big screen, years before it had been done as a full length animated series of movies? 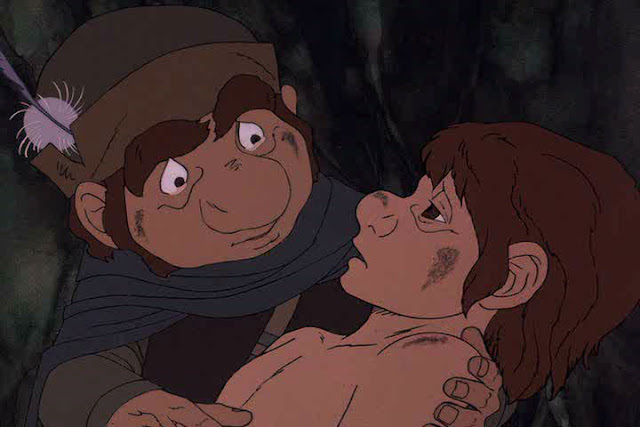 Most well-known of these, perhaps, the 1970s feature length animated movie for The Hobbit, and then the full-length animated movie for The Lord of the Rings. Least known in the lot would be 1980's Return of the King when was completed and aired on ABC television in the late Spring of 1980. The film was done by Rankin/Bass who, most famously, are behind the now-classic claymation holiday films like Frosty the Snowman that still air on television during the holiday season some 30+ years after they were first completed. Whereas famous animator Ralph Bakshi was the man behind the animated Lord of the Rings, it was Rankin/Bass who were the folks responsible for The Hobbit animated movie as well as Return of the King, which is often mistaken as a sequel to the Bakshi movie. While the animated Return of the King is certainly faithful to the Tolkien story, the producers decided to make it a quasi-musical movie. Which makes it all weirder than it always was! For sure, one of the strangest and off-kilter animated kids movies of the early '80s.